Tranquility and worship were reborn on 5th of Shab`an,38 A.H. when the son of 3rd Imam,(Imam Hussain AS),Imam Ali bin Hussain AS came to this world. He was born in Kufa.He is known as "Zain ul Abedin" AS meaning "the Beauty of Worshippers" and "Syed Us Sajjad" AS meaning "the Leader of Worshippers". 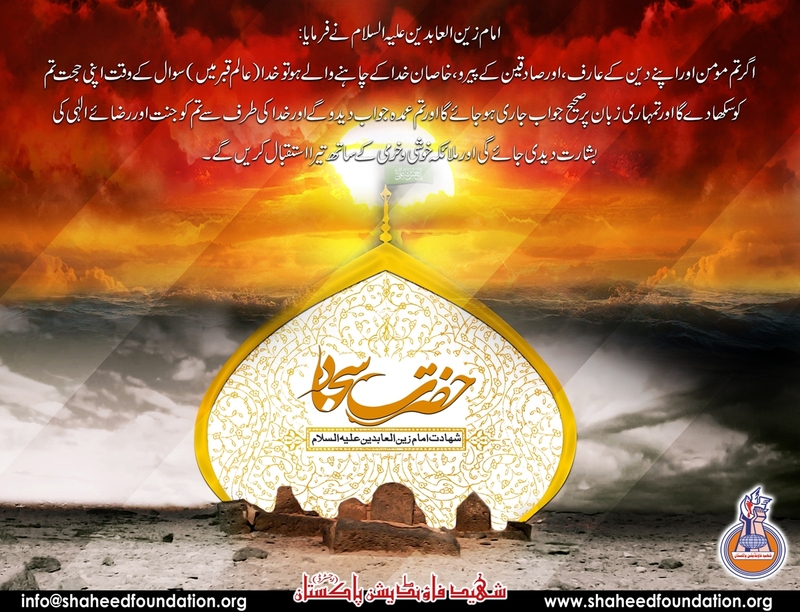 His mother is Bibi Shehrbano (S.A), the daughter of a Persian king. When he became old, he became thin and weak. This is because he worshipped Allah constantly. Moreover, the tragedy of Karbala drowned him in sorrow and pain, for its terrors accompanied him till he met his Lord, Almighty Allah. "What Allah has concealed from you is more than (this). Shall I help you with your need?" The person was ashamed of himself and wished that the earth would swallow him up.